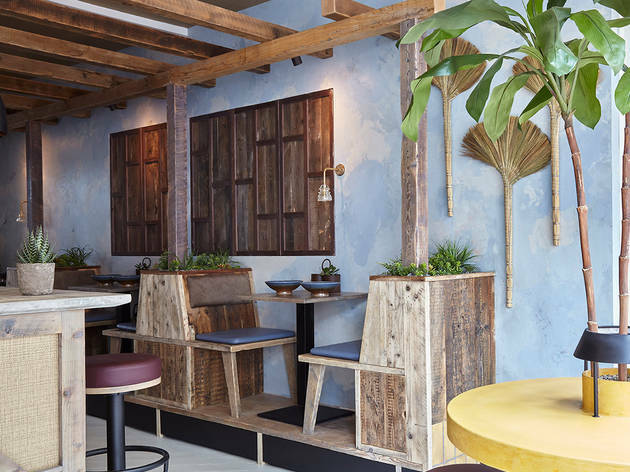 A stylish Vietnamese restaurant between Ladbroke and Westbourne Groves. Who’s up for a DIY Vietnamese taco? Okay fine, it’s not actually called that, but it should help you make sense of the signature dish at this stylish Ladbroke-slash-Westbourne hangout. 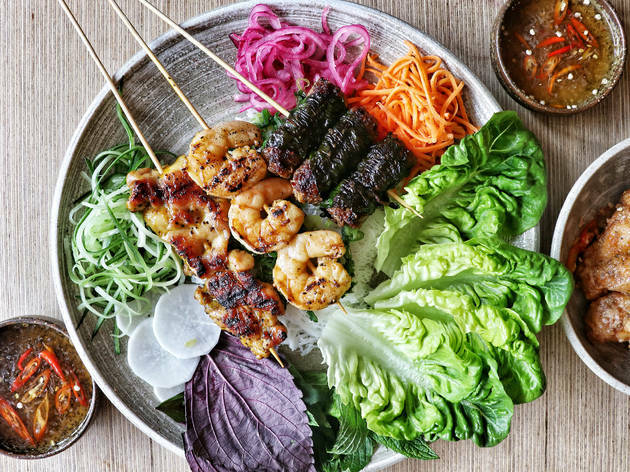 Instead of a tortilla, you pile fillings on to a steamed rice noodle pancake (not unlike a Sri Lankan string hopper) or on to a leaf of baby gem. Or both. Then you add something off the grill. Of the four options, the beef in betel leaf (£4.60) is the best, though you can try three for £12. They arrive on a platter, piled high with not just those pancakes and leaves, but also Vietnamese herbs (delicate perilla leaves, scented Vietnamese mint), pickles, curls of crunchy veg and a sweet-with-a-hint-of-heat, fish-sauce-laced dipping sauce. It’s a Russian doll of a sloppy, fragrant roll that’ll have you licking your fingers, and possibly your palms, when you’re done. But that’s just the one dish. What’s so great about Mam – from the same crew as Dalston’s Salvation in Noodles – is that it also does com (rice bowls), pho and snacky street food. Most of which was superb. 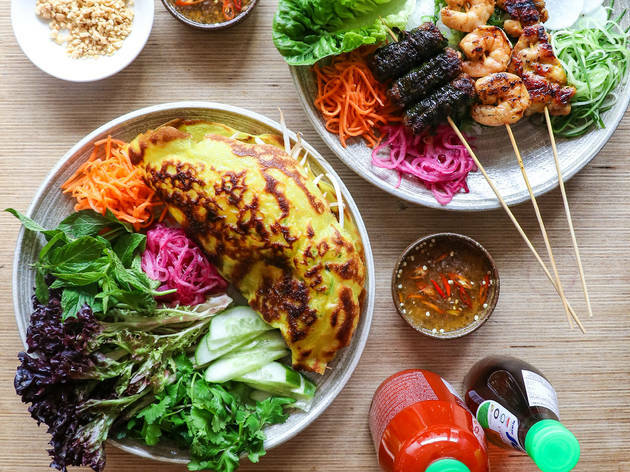 Take the prawn banh xeo: a crisp savoury crêpe, loaded with seafood and sprouts. Or a plate of dense, frilly-edged dumplings (similar to soft, steamed wontons), jammed with minced chicken, prawn and water chestnuts. There was another dipping sauce: this time fiery, oily, salty and sweet. Plus spring onions ‘two ways’ on the side (fresh and sliced, tiny and crisp). This is the kind of attention to detail I love. Another thing: portions are huge. The beef shortrib com might seem relatively pricy at £13.50, but it was enough to feed two. And it was deeply moreish: fatty-edged, full-flavoured, velvety beef over squishy rice, with a tangy, fiery sauce and half a soft egg. It’s not especially refined, but it’s not meant to be: this is a dish to eat with a few beers, or better yet, a stinking hangover. But Mam is also about the vibe. Staff are chummy and helpful. The look is Hanoi by way of London (warm woods, sleek lines and dangling warehouse lights, plus pots of exotic oversized foliage). It’s essentially one of those great little local spots you could quite happily eat at most nights of the week. Go with some mates and get stuck in. Dinner for two with drinks and service: around £85. 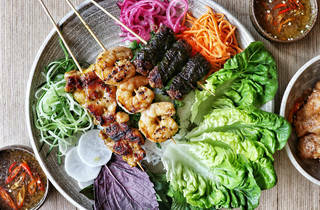 MAM is a new Vietnamese place in Notting Hill’s All Saints Road, just steps away from The Rum Kitchen. It is a beautiful venue: light walls, light wooden and brass fixtures. There are small booths and bar seating in the fore room, and a dining room proper at the back with a conservatory style glass ceiling. 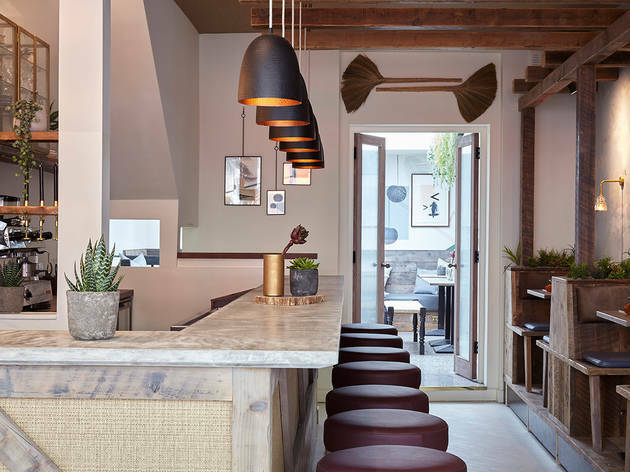 Given the location and the decor (it could be straight out of AD magazine with all the nice touches, textures and finishings and succulent plants in abundance), the prices are actually democratic. They do phos, skewers and rice bowls (all served with an abundance of fresh herbs and leaves) and encourage sharing. The cocktails' focus actually reminded me of the famous Nam Long Le Shaker in West London. But the service, oh my god, they are such a long way off, it actually was funny. They went wrong pretty much everywhere along the way. My friend arrived earlier, and after multiple attempts to take her order (she politely said she’ll order when her plus one - me - arrives) they gave up, so that when I did arrive (I was only 5 min behind!) they must’ve written us off completely and it took an effort to first get the menu and then to get them to take the order. None of the waiting staff around seemed to know the menu so they kept calling on each other for help re. the ingredients (i.e. ‘are they using bone or veggie broth for the prawn and tofu phos?’, ‘what are the pickles in the ‘plate of pickles’?). I’ve ordered a cocktail and they forgot to place the order at the bar. The food then took ages to arrive despite this being a Monday night and most tables were empty. My cocktail arrived after the food. It then took even longer to pay. The card reader ran out of paper and as the waiter struggled to replace the roll the reader basically disintegrated into a bunch of parts flying all over the place. Luckily, I and my friend were both in no hurry and a good mood, so could laugh it off. But the food was good and the portions were generous and the staff are friendly and all smiles and were very apologetic about the mishaps. So I really hope the restaurant finds its bearing and I will be back after some time goes by to check! But for now - three stars. My friend and I ate here Friday and overall had a very good experience. I appreciate I was able to taste two of the wines I was considering as the slightly pricier Gewürztraminer (which did have a bolder, better taste than the Macabeo) was the wine I selected. My friend and I each for the veggie chay rice bowl option but I am dinking a star because only white rice is offered- boo and I likely won’t return for that reason alone. However, that dish was quite flavorful, especially the miso aubergine. Large chunks of the aubergine and other veggies were piled atop the dish, with a small dish of soy sauce accompanying it. I ended up eating most as it was so tasty. There were few other people in the restaurant at the time we ate -6:30-7:15pm- thereabouts and service was fine. What a special find! Hidden in the back streets of Portobello this Vietnamese restaurant ticks all the boxes. Everything about the restaurant design is exceptional, without being too in your face. I would highly recommenced the Pho which was extremely fragrant and delicious (£10-14). The restaurant is small so try and book.